There’s something mysterious and captivating about Gary Jules (cover of Tears for Fears) hit song “Mad World”. It has an intriguingly simple and beautiful melody. A single vocal line with no embellishing riffs or runs. A light, airy feel to the whole production that pulls you into the song and makes you feel really good about it. Until you stop and really listen to it. Then we come to the lyrics which are so dark and disturbing that we wonder how we ever came to like this song at all. I’m not even sure how to categorize this song … a lyrical oxymoron … a musical paradox … a harmonic charlatan? The crazy dichotomy of the dark depths of its lyrics underneath a beautiful first impression and how it lightly lands upon our senses. Its ability to say what it (or he who penned it) is actually feeling. We may not like the feelings but it is a rare gift to be able to express them. It’s true … when people run in circles it is a very mad world! It makes me think about whether some of that same dichotomy is at work in people. I wonder what contradictions how this is at work in the way I show up? Is my displayed exterior in alignment with what is going on inside? What happens when it is not? Do others notice the misalignment? Does anyone notice? Does everyone notice? Or is there a subset of people who elevate their awareness of me and catch the subtle signals I give off that say I am different than I first appear? I think that those who practice being present in each moment are adept at spotting such misalignment. Because we are truly present with the other person, we don’t just hear the pretty piano line of our surface interactions. We truly hear the message of within our connection. There is a whole body of literature on this subject … from the Harvard Business Review article Primal Leadership which discusses the correlation of leadership effectiveness to moods to Judtih Glaser’s book Conversational Intelligence who discusses the immediate impact of how a person shows up in a conversation based on the electromagnetic field generated by our hearts. I further wonder what the cost to me of such contradictions is. When I am not aligned am I less believable? Am I still as influential? Does it feel safe to others to share their true opinions and be otherwise vulnerable? My belief is that the answer to these questions is a solid no. People know when their leaders aren’t in alignment. I’m not saying people are consciously aware that their leaders façade is out of sync with what is really going on, but they know at that subconscious level that feeds trust and commitment. Something will alert them that this is a time to hold back. So what can we do as leaders to help ensure alignment? For me, it is again about being present with ourselves. Are we aware of our mood, our posture, our focus? Are all of the things aligned with the immediate environment we find ourselves in? For example, are we distant in the midst of the team celebrating success? Are we smiling and projecting personal confidence at a time when others are down or feeling at risk? Are the words we are speaking representative of what we believe? Its true what the song says. “When people run in circles it’s a very, very mad world.” What is it that we do that makes sure this isn’t happening in our systems? Are we sufficiently present such that we are constantly aware of our own alignment and its impact on others? To get you in the mood to run in a couple of circles … here’s Gary Jules and Mad World! He sings of the land of the Walking Breathing Dead — the land we all at one time or another inhabit, until the day we wake up and are willing to risk stepping outside our comfort zones. Until we risk speaking our truth, even though we believe disagreement equals rejection. Thanks for sharing this Ian. There is so much adaptation to be unlearned, so much essential essence to be awoken that until we hear the truth of what he is singing, we close our minds to the beauty and wonder of every moment. 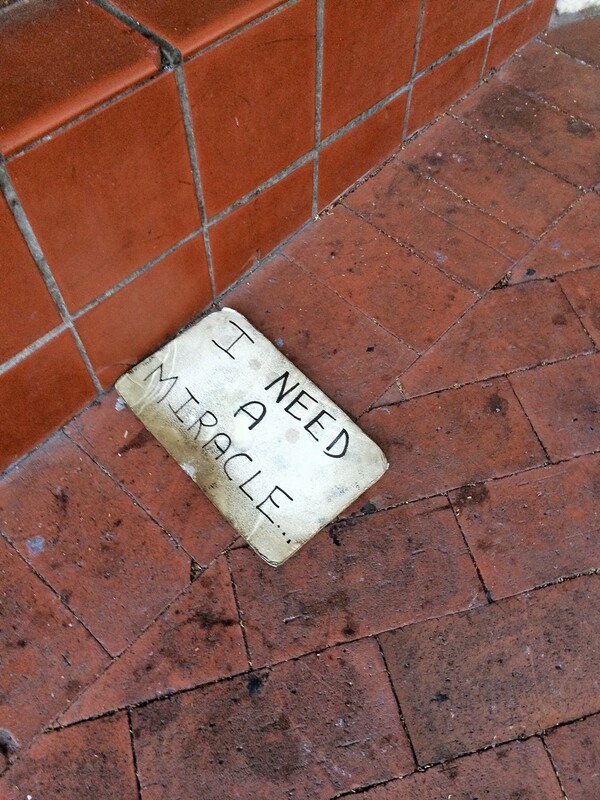 Your photo of the sign, I Need a Miracle — is compelling. miracles are everywhere, but when we live as the WBD, we can’t see them or feel them or even know they’re falling all around.. Looking forward to the surprise song when I get home! I dislike being misaligned, but it is an unavoidable state we sometimes have to pass through! I think people know when their leaders are not aligned as well – I agree. We all have off days though, what would you recommend? A song that caught me off guard (I thought it was a love song!) Was In the Air Tonight by Phil Collins. I KNOW I have days where I don’t show up aligned. My only known antidote is to stop and deliberately centre myself. Even that can be easier said than done and when that is the case then it is necessary to do some introspection to find the root of the misalignment. A great one for me today. Thanks. As for songs: here is one that helps keep me grounded. Thanks for the great song reference! That could turn into a post as well! There WILL be “days like this”! No apologies. I love when a community comes together! Next Next post: What About You?